As our royals slowly ease themselves back into the public eye after the holiday, we have another very formal event with a corresponding dress code in Spain: Pascua Militar, the annual New Year's military parade and ceremony. To go along with the gentlemen's military uniforms, the ladies go more formal with long skirts in a modern type of court dress. 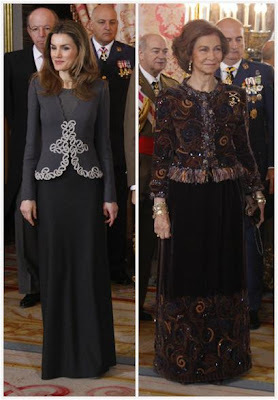 This isn't quite as sparkly as the times when you see these outfits with orders for the ladies in other countries, but I think it has to be given special attention because, well, frankly this is about as fancy as the Spanish royal dress code gets these days. It's been entirely too long since we've seen them bust out their tiaras (not a good time for state visits, I suppose, on account of the economy and whatnot). So we'll take a long skirt when we can get it! 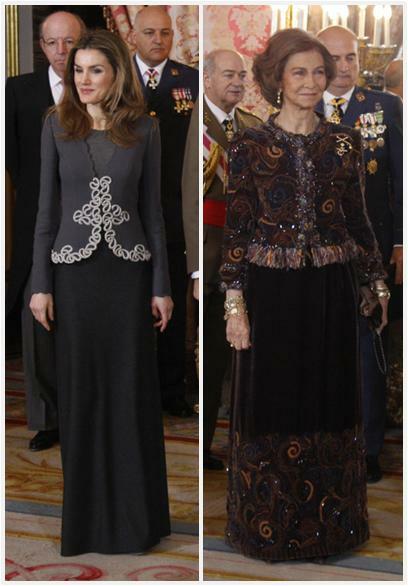 Letizia's gone deceptively simple. Sure, she has ornamentation, but she also looks like she's thrown a t-shirt on underneath. Not my favorite of these outfits for her (a flashback may be in order for Friday, methinks). The Queen, on the other hand, well. This lady has a talent for packing on the ornamentation, does she not? Upholstery-esque print! Fringey bits! Sparkly thingies! As many bracelets as the human wrist can support at a single time! Etc! And yet she's kinda pulling it off, so kudos indeed. What's your verdict on this year's batch of long skirt-ed wonders?